Of all of the most mysterious things one can experience—spiritual ecstasy, verifiable nonlocal awareness (or Remote Viewing), the Aha! moment of creative genius—Remote Viewing is the one that can be learned. In doing so, one can obtain both sense impressions and "knowingness" concerning persons, places, or events about which one should have no knowledge due to shielding by time or space. Closely related to nonlocal awareness is the expression of nonlocal intention, traditionally called healing, which uses many of the same techniques as Remote Viewing, but in a proactive way that affects the well-being of another. Taught by one of the founders of Remote Viewing and a pioneering researcher in healing, this workshop is built on thirty-five years of laboratory and field research. The techniques presented have been repeatedly tested and have shown themselves capable of allowing almost everyone to open to the experience of nonlocal awareness and to express healing intent. This seminar also covers meditation, offering an approach especially designed for the Western mind. (Meditation has been shown to be the most important discipline a person seeking to open to nonlocal awareness can develop.) The workshop both presents concepts and allows participants to experience firsthand these aspects of extraordinary human abilities. Visit the Esalen site for more information on how to register. The 50th Annual Meeting of the Parapsychological Association is just around the corner. Right now I've got at least one confirmed travel companion (a grad student), and I have room in my car forat least one (possibly two) more. Please contact me if you live near the east coast and need a ride to the conference. Also, if you live in or around New York City, I'm looking for a couch to surf on (just me) for one night...probably Monday, July 30th. I've never seen NYC and it looks like I might have a day to kill on the way to Halifax. I've estimated the cost of gas to be around $400 round-trip. That's a lot of candy bars. A couple of kind readers have already donated to Public Parapsychology for the trip, but we're going to need some more help if we want to get my Monte Carlo all the way to Canada and back. Any and all donations received through paypal will go directly to my gas tank and benefit not just myself, but my travel companions as well. 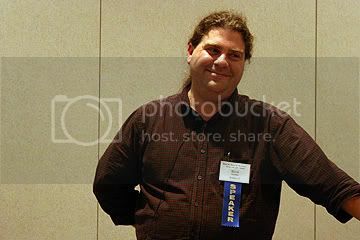 Helping us get to the conference will also make certain that I have the opportunity to review, photograph, and summarize the conference here at Public Parapsychology (as well as give two presentations at the conference myself). Hopefully you guys enjoyed the ASPSI conference reviews and would like me to be your eyes and ears for yet another event this summer. As stated at their website, the first purpose of the Academy of Spirituality and Paranormal Studies is "to encourage dialogue, exchange of ideas and cooperation between clergy, academics of religion and philosophy, scientists, researchers and academics of all scientific and humanistic disciplines in the fields of psychical research and new disciplines, as well as the historic sciences." My impressions at their latest conference suggest that the academy is on track with this purpose. 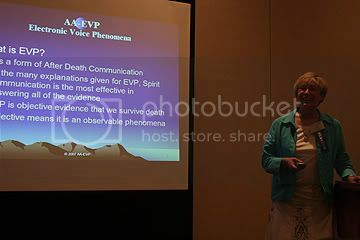 The theme for this year's conference of the ASPSI, What the Bleep do We Know about Life after Death?, is an important question to me and many of my fellow researchers in the field of parapsychology, which is why I found it appropriate to review the conference in this blog. 1. Inspiring presentations from some of the leaders in the fields of spirituality and nonphysical studies. 2. New insights on a variety of spiritual and paranormal topics. 3. Ideas that you can use both personally and/or professionally. 4. Meeting and exchanging ideas and information with other attendees and presenters. I am happy to report that the ASPSI conference fulfilled each and every one of these objectives. I was impressed with the variety of perspectives that were presented. Many of the presentations were given by clinical psychologists, philosophers, religious leaders, and mediums. Personally, I have been absorbed in my own research groove as of late, and most of my professional contacts have been with other scientists. It was refreshing to hear some non-parapsychological, yet critical, perspectives on the survival issue. I was also impressed with the effort to make the conference financially feasible for attendees. I am an academic patron of the ASPSI. For me, the conference fee was $120, and I had the option of paying and extra $180 for a shared dorm room and meals for the entire conference. That means that for $300 ($400 if you count the $100 cost of academic patronship - which includes a subscription to their quarterly journal, newsletter, and the conference proceedings), one can enjoy the conference, three nights of lodging, and three days worth of meals on the DeSales University campus in Pennsylvania. That is more than reasonable. That's a bargain. Additionally, because most attendees had their meals in the DeSales University cafeteria (which was not half bad, by the way), there were multiple opportunities to talk and mingle with the presenters and attendees. In fact, I probably talked with more people at this conference than I have in the handful of conferences that I have attended combined. 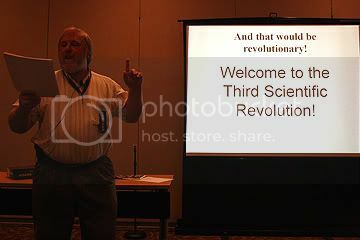 On the first day of the conference, it was announced that the number of attendees of the ASPSI conference had doubled since last year...probably in no small part to having Dr. Raymond Moody as their keynote speaker. I hope that these reviews will inspire an even larger attendance next year. The 2008 annual conference of the ASPSI will be held on June 6-9 at the same venue. The theme of next year's conference will be Beyond the Veil: Evidence for Life after Death. Hopefully, I will see you there. 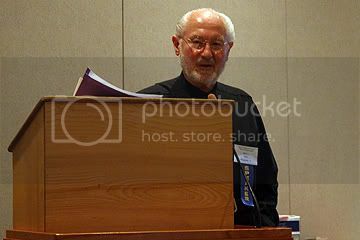 The final day of the annual conference of the Association for Spirituality and Paranormal Studies commenced with a talk by Dr. James E. Beichler titled Let There Be Light: The Scientific Bleep on the Afterlife. Dr. Beichler holds the only advanced degree in paraphysics in the world from an accredited school. He is an associate professor of physics at West Virginia University in Parkersburg. 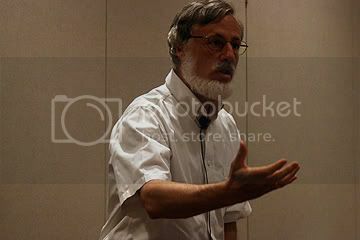 Dr. Beichler discussed how science cannot accept and therefore rejects the notion of an afterlife because it does not have the conceptual tools or the vocabulary to accept the survival of consciousness. The possibility of an afterlife was relegated to a religion during the Scientific Revolution so the tools necessary to develop a theory of the afterlife as well as the nature and meaning of life were never developed. Dr. Beichler predicts that we are on the edge of a third scientific revolution, which will change our fundamental concepts of reality. He is working on a book To Die For: The Living Book of the Dead, which will hopefully be reviewed here on Public Parapsychology in the near future. 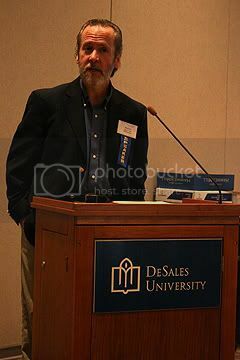 Boyce Batey, executive director of ASPSI, psychical researcher, and hospice volunteer, presentated a pattern and content analysis of responses by 30 members of ASPSI between August 2006 and February 2007 to 10 questions in a Survival Research Questionnaire, which he developed. 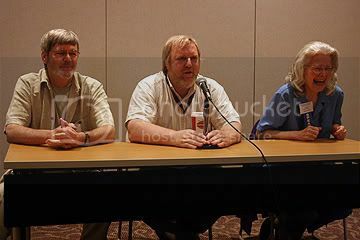 The conference closed with a panel P.M.H Atwater, James Beichler, and Tom Butler with the theme What the Bleep Do We Know about Life After Death. Each of the panelists were invited to give their take on the subject, and after some debating between Beichler and Butler, audience members were granted an opportunity for some final questions. Kevin Kovelant, a masters candidate in Consciousness Studies and Dream Studies at JFK University, and a very dear friend of mine, gave his first ever conference presentation following dinner on Day 3. Titled, Peering through the Veil: Death, Dreams, and the Afterlife in Sufi Thought, Kevin's presentation discussed how Sufism offers a conceptual framework for understanding the phenomena of 'visitation dreams'. During his presentation, he addressed the question, if the dead do visit us in dreams on occasion, what does dreaming have to do with survival after death? Kevin is currently working on completing his thesis "Visitation Dreams from the Dead" after having had many of them throughout his life. 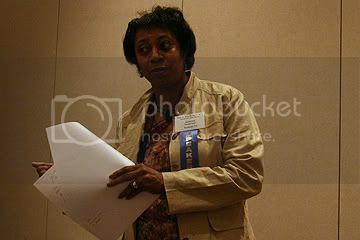 Closing Day 3, Jeanetta W. Dunlap, Ed.D., an Education Specialist as well as a medium and healer gave a workshop on past life memories, guiding the conference attendees through exercises designed to give insight into past lives for personal empowerment. The last fifteen years has produced significant research linking belief in the paranormal to the experience of psychological dissociation. In this presentation, emerging research findings regarding the relationships between dissociation and the reporting of unusual experiences in non-clinical populations will be reviewed. Specific attention will be given to the relationship between the experience of dissociative phenomena and paranormal beliefs including: traditional religious belief, psi belief, witchcraft, superstition, spiritualism, extraordinary life forms and precognition (Tobacyk, 1991). This will be followed by a discussion of my recent investigation into the relationship between dissociation, locus of control and specific paranormal beliefs. The specific aims of the study were to: 1) confirm the existence of relationships between dissociation, paranormal beliefs and locus of control within a non-clinical population; and 2) determine whether these relationships represent a true correlations between distinct psychological constructs or reflect a general tendency among the highly dissociative to report unusual experiences. Data from 132 adult undergraduate students from Monash University revealed a positive relationship between self-reported dissociativity and unusual beliefs. The most striking, and perhaps the most easily understood, was the relationship found between dissociation, external locus of control and a tendency toward superstition. These results will be discussed in terms of the role of dissociation in the everyday functioning of non-clinical individuals. 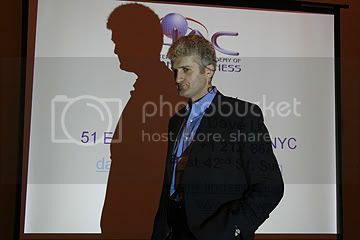 Following lunch, David Lindsay, executive director of the International Academy of Consciousness (IAC) gave a presentation titled Out-of-Body Experience: The Definitive Afterlife Research Tool for the 21st century. During his presentation, the conference attendees learned a little bit about IAC, its laboratories and research projects. A new field, projectiology has been proposed for studying OBE's, and a further field, conscientiology has been proposed by the IAC for studying consciousness. These fields endorse self-experimentation, encouraging their researchers to proactively induce OBE's for themselves, rather than relying on the third-party observations of research subjects. Reverend Lawson M. Smith discussed Life after Death as Presented in Heaven and Hell by Emanuel Swedenborg. Rev. Smith is a pastor of congregation in Kempton, Pennsylvania and principal of its elementary school. His presentation consisted of highlights from Swedenborg's 1758 work on the subject of life after death. For the last session of the afternoon, the directors of the American Association of Electronic Voice Phenomena, Tom and Lisa Butler, gave an introduction to EVP's - voices recorded on electronic devices. Their presentation covered some basic information on paranormal voices with examples. 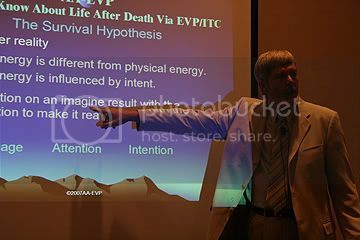 Personal stories associated with the examples illustrated why the directors feel that EVP's provide evidence for the personal survival of death in an individual conscious state. Both Lisa and Tom are ordianed Spiritualist ministers, certified mediums, and commisioned healers. Lisa has a degree in psychology and Tom has a bachelor of science degree in Electrical and Electronic Engineering. Day 3 of the annual conference for the Academy of Spirituality and Paranormal Studies (ASPSI) began with a presentation titled Life Within Life: A Case Study Suggestive of Integrating Past Lives and Altered States of Reality into the Present by Dr. Steven Hoyer, a clinical psychologist and adjunct instructer in the department of psychology and counseling at Pittsburg State University. Dr. Hoyer presented a fascinating case study about a woman whose near death experience involved traveling to an alternate reality, living out an entire lifetime there, and then returning to her own life. Dr. Hoyer also promoted a book that he co-wrote with the woman, Fireweaver: The Story of a Life, a Near-Death, and Beyond . After his talk was over, copies of the book flew off the table. In fact, he might've sold more books than anyone else there as far as I could tell. After hearing such a fascinating tale, I was tempted to buy a copy for myself, but I already have a stack of books that I'm way behind on reading. 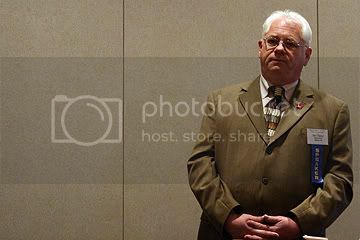 Following that, Reverend Daniel L. Kivel, a Spiritualist minister, medium, and trustee in the Independent Spiritualist Association shared his personal experiences following the death of his son on Memorial Day weekend in 2006. In a talk titled Visitations, Rev. Kivel described the communications that he has recieved from his son, as well as reports of visits to several of his son's close friends and their reactions. The last talk of the morning sessions was titled Over a Century of Research on After-Death Communication. 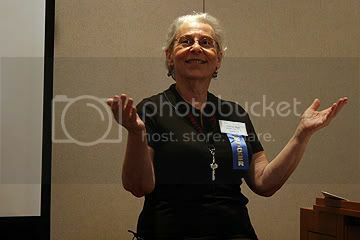 Sylvia Hart Wright, a retired librarian and City College of New York professor, outlined the work of numerous researchers in the field, starting with the work of the Society for Psychical Research and carrying on into the present. Her paper emphasized that studies done in the U.S. and abroad have documented that it is commonplace for healthy, normal people to experience contact with the dead. I just got off the phone with Marcel Cairo a couple of hours ago, who had me as a guest on his show, AfterLifeFM. Like I said before, this was my first interview, and knowing that, Marcel really rolled out the red carpet for me. Thank you, Marcel, for making my first time so special ;-). We talked about a lot of stuff, from how I got interested in parapsychology and the start of this blog, to some of the projects I am working on, and my upcoming trip to the PA conference. Along the way, I answered a few general questions about the field and my own beliefs (or lack thereof) about post-mortem survival. I think I did alright, though I've made a mental note to banish the word 'whatnot' from my vocabulary permanently. Click here to hear the voice of 'The Intrepid PsiChic'. Tomorrow night at 7pm Eastern (4pm Pacific), I'm going to be interviewed by Marcel Cairo on his (relatively new) live podcast AfterlifeFM.com. This is my first interview, so Marcel has promised to go easy on me. We'll be talking about whatever comes up, so if you have any questions for me, he can take your calls live at 646-478-5711 after 7pm.